Loggly, as a SaaS log management solution, relies on the Internet being a fair playing field for all the data traffic. Right now, new FCC Chairman and former Verizon lawyer Ajit Pai has a plan to reverse net neutrality and give big cable companies immense control over what we see and do online. If Pai gets his way, the FCC will give Internet Service Providers control over what we can see and do on the Internet and the power to slow down or block websites and charge apps and sites extra fees to reach an audience. If we lose net neutrality, we could soon face an Internet where some of your favorite websites are forced into an online slow lane, while deep-pocketed companies who can afford expensive new “prioritization” fees have special fast-lane access to Internet users — tilting the playing field in their favor. You, as a customer, may be forced to pay more for the same services since these deep-pocketed companies now have pricing power. Log data is mission-critical to many of our customers. Imagine that your data traffic to Loggly is throttled, slowed down, or even blocked without your consent. How will you be able to monitor your systems on premise or in the cloud, or diagnose problems in your production code? Throttled data has the potential to hinder effective monitoring, delay troubleshooting, and adversely affect company operations and revenue. On July 12, 2017, many Internet companies will join forces on this Day of Action. Your work on the Internet may be slow on that day. And note that this slowdown may become the norm if net neutrality is removed. To monitor Internet speed, Loggly users such as Stephen Phillips have sent Internet speed measurements via syslog to Loggly for visual monitoring and anomaly detection. 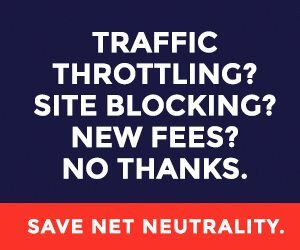 You can follow the instructions on scphillips.com to use Loggly to monitor your Internet speed on the Day of Action and get a taste of the impact of net neutrality removal. Special thanks to Stephen! We at Loggly want to make sure your systems run without any glitches. Net neutrality is key, not only to keeping the Internet a fair playing field, but also to keeping business running for tens of thousands of companies and billions of their customers. To find out more about the Day of Action, visit https://www.battleforthenet.com/july12. We hope you do what’s right for the Internet!